Posted on October 21, 2012 by M.
Excellently stated. I could not have written this better myself, and therefore I give you hecatedemeter’s rendition of the framing of the issue of women’s reproductive rights. Of course it’s good this came up in the debate, and of course it’s good to support women’s rights. Women are worthy enough to be supported simply because *we* matter. There need be no other reason to uphold our autonomy and power over our decisions. I’m feeling good about being worthy. I appreciate good framing and I understand what President Obama and Atrios are doing when they explain that giving women access to family planning information and other forms of birth control and abortion (see what I did there?) implicates economic interests and the interests of men and children (aka “families,” which, oddly, in America don’t appear to include the women and their children who are not attached to men), as well as women’s rights. And, Obama and Atrios are right. And, it pisses me right off. First, of course access to, for example, free/cheap/effective, and safe birth control (including abortion; see what I did there?) has important economic ramifications for women and those who love them/have their lives entangled with them (aka, pretty much everyone). Posted on August 21, 2012 by M.
Thanks Saira. Let’s root out the inequality and double standards and see things as they really are; people’s private life is private, and ought to have Nothing to do with their career. Give Kristen Stewart her job back. Posted on June 12, 2012 by M.
My mother is one of the greatest blessings in my life. She is the guiding light who made it okay for me to not wear heels, to eat to be healthy, to be introverted when I feel that way, to connect deeply with nature, and so much more. Once when I was pre-teen and feeling a lot of self-doubt, I asked if I was born because I was wanted. It is a great blessing that you and your profound capacity for love are in this world, Mom. You give to the world through your nurturing love for your family, devotion to your Creator, sharing your knowledge with those who are learning English, talent for beautiful writing from the heart, delicious cooking, wonderful memories, and everything else about you. Happy Birthday, I love you!!! Posted on May 29, 2012 by M.
Posted on March 30, 2012 by M.
Yes, I just featured Irene’s poetry recently. I can’t get enough. Bring it forth like the sun through water. The sound of it has poisoned me for so long I can’t remember the words to my heartbeat, only the tune. Her Voice carries like the dandelion seeds on the breeze. It is time to Revolve, She says. I am nearly there, I reply. Posted on February 16, 2012 by M.
Often I am frustrated in my attempts to open jars. Here’s a trick, from my dad, given to him by his mom. Run the lid of the jar (yes- the jar in question is still sealed) under warm water for a few minutes. This loosens the seal and the jar will open more easily. This works even when the plastic grip does not. Valentines day… or Hallentines day. Posted on February 14, 2012 by M.
Middle school was harder- the boys gave the [other] girls jewelry, and exchanging cards was no longer mandatory for the entire class. That year was the first that I felt utterly miserable and cynical. I sat alone at my desk; no jewelry, no cards, no conversation. I have had several sweet Valentines cards and candy, dates and dinners since. Once, I designed a bouquet for someone, from scratch, at a fancy flower shop. Another time, I created a youtube playlist with songs I felt meant something to ‘us’. A few years ago I realized the pressure I felt applied to this particular day. I felt compelled to dress up cute, to buy something nice, to make something VERY meaningful and special for the person I’m dating, to have a special dinner…. and I realized that not everyone thinks that way. And today, that’s ok. It takes the pressure off. I’ve had some disappointments from people I’ve been in relationships with, because I was trying too hard and expecting too much. All in all, I feel blessed. Today I am choosing not to base my happiness on my relationship status. I am who I am (wonderfully creative, sweet, beautiful) regardless of whether I have a date on any given day. Valentines day is no different. It’s sort of cute, and sort of weird, to exchange cards and gifts on a particular day. I personally would rather take time when I notice that I feel affection and appreciation of someone to let them know, possibly pick them some flowers or give them a brownie (which I could have eaten!) or even just tell them ‘Hey, you’re really important to me,’ and ‘I’m glad I know you. You make me smile.’ It feels strange telling people affectionate stuff out-of-the-blue, for the first 7 times or so, but it gets better. Try it out. 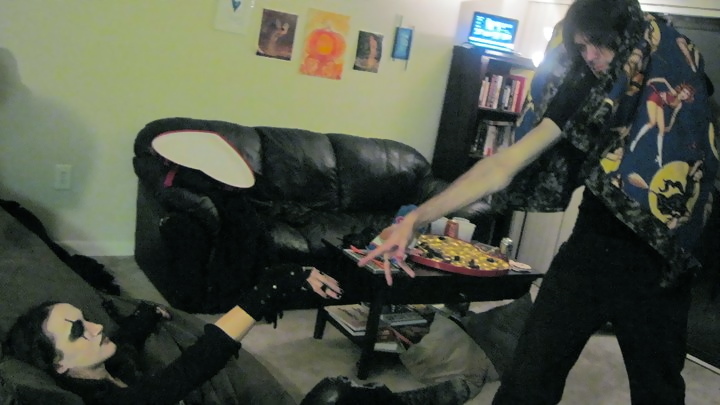 Last year, friends and I held a Halloween party on Valentines day. It rocked. No pressure to be all cute and cozy, no pressure to exchange anything, and plenty of people to socialize with so no one would have to feel alone and lonely. I’m feeling good about appreciating friends, and letting go of ‘expectations’ and pressure.